Hermann Goering (or Göring) was a World War I fighter ace who joined the Nazi Party in 1923. He helped Adolf Hitler plan the Munich Beer Hall Putsch against the Bavarian government the same year, was wounded in the leg and groin on the after­noon of November 9 when police fired into the crowd at the Odeonsplatz in Munich (he developed his life-long addition to morphine afterwards), and fled to Austria, where he remained in exile until granted amnesty in 1926. In 1928 Goering won a seat in the German Reichstag and became its president in 1932, six months before Hitler was elected German chancellor in January 1933. Goering became minister without portfolio, headed the Prussian state’s ministry of the interior, and founded the Gestapo (German Secret State Police), whose notoriety grew under his successors Heinrich Himmler and Reinhard Heydrich. In 1935 Hitler appointed Goering commander of the Luftwaffe. The next year he was put in charge of the Four Year Plan, drew in the ministries of labor, agriculture, and economics under the plan, and assumed near dictatorial control over the German economy in the build-up to World War II. The creation in 1937 of the state-owned Hermann Goering Works, a gigantic industrial enterprise that employed 700,000 workers and amassed a capital of 400 million marks, enabled him to accumulate a huge fortune. On September 1, 1939, the day Germany invaded Poland, triggering World War II in Europe, Hitler nominated Goering as his successor and deputy in all his offices. In July 1940 Hitler elevated him to the rank of Reichsmarshall, a rank senior to all other commanders of the German armed forces (Wehrmacht). Goering’s popularity inside Hitler’s inner circle reached its peak between late 1939 and early 1940 largely because of the Luftwaffe’s excellent performance during the invasions of Poland, France, the Low Countries, Denmark, and Norway. After that his prestige declined. Failures to prevent the Anglo-French evacuation at Dunkirk and to wipe out the Royal Air Force Fighter Command during the Battle of Britain prior to the invasion of England (Operation Sea Lion), both in 1940, were compounded by the beating German cities began taking from combined bombings by U.S. and British air forces. His boast that the Luftwaffe could supply the besieged German Sixth Army at Stalingrad (Battle of Stalingrad) shattered his credibility at the highest levels, though he remained genuinely popular with the German masses. In the final years of the war Goering lost influence to his rivals and retreated to his estates, where, a bloated shadow of his former self, he pursued his extravagant tastes and lifestyle surrounded by art treasures he had mostly stolen from public and private (chiefly Jewish) collections throughout Europe. He was finally stripped of all his titles and offices by Hitler days before the latter’s suicide in 1945 after suggesting that he should assume power if the German leader were incapacitated in any way. On May 9, 1945, Goering was taken into custody by soldiers of the U.S. Seventh Army. 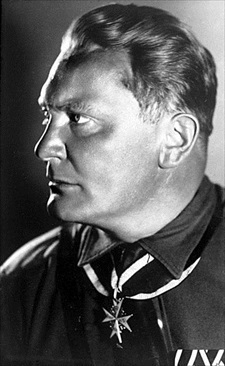 Convicted of conspiracy to wage war, crimes against peace, war crimes, and crimes against humanity at the Nuremberg Trails, Goering escaped justice by poisoning himself with cyanide the night before his planned execution.